Chelsea captain John Terry is an injury doubt for Sunday's FA Cup fifth-round tie against Manchester City, says manager Guus Hiddink. 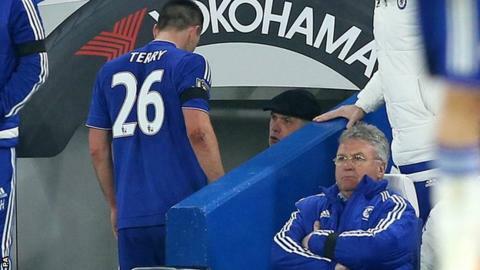 Terry, 35, was ruled out of Tuesday's Champions League game at Paris St-Germain with a hamstring injury. Hiddink said it was "difficult" to know whether he would return against City. "That's why we prefer to leave him at the training centre, to have daily treatment and see how his development will be for the weekend," he added. Terry was substituted after 38 minutes of Saturday's 5-1 Premier League win over Newcastle United, with right-back Branislav Ivanovic moving alongside Gary Cahill at centre-back. United States defender Matt Miazga, 20, and 18-year-old academy defender Jake Clarke-Salter have also travelled to Paris and could feature on the substitutes' bench. Kurt Zouma, Terry's first-choice partner at centre-back, was this month ruled out for the season with a knee injury. "Of course not having John is a bit of a setback. He's a leader," said Hiddink, who has not lost in 12 matches since replacing Jose Mourinho in December. "But I'm not the type of coach or manager who starts moaning and moaning. "We go on and the players who will replace him, I have huge confidence in them."